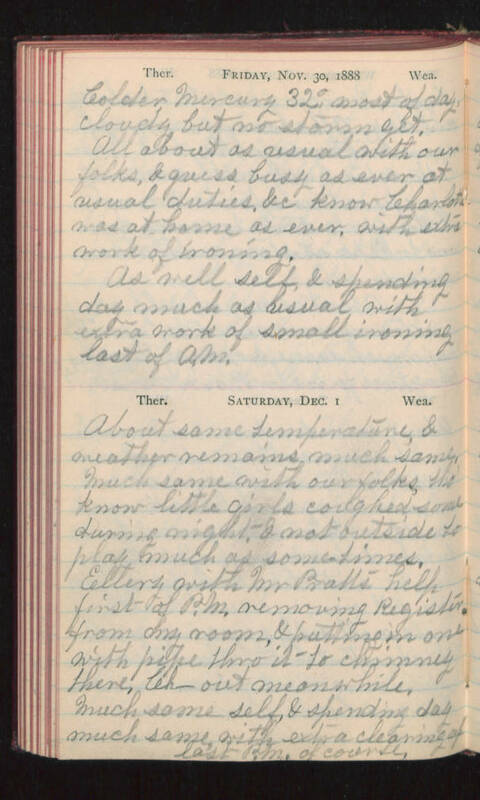 Friday, Nov. 30, 1888 Colder Mercury 32° most of day, cloudy but no storm yet. All about as usual with our folks, & guess busy as ever at usual duties, &c know Charlotte was at home as ever, with extra work of ironing. As well self, & spending day much as usual with extra work of small ironing last of A.M. Saturday, Dec. 1 About same temperature, & weather remains much same. Much same with our folks, tho' know little girls coughed some during night, & not outside to play much as some times. Ellery with Mr. Pratts help first of P.M. removing Register from my room, & putting in one with pipe thro it to chimney there, Ch- out meanwhile. Much same self, & spending day much same with extra cleaning up last P.M. of course.